There's no shortage of self-improvement books, courses, manuals, videos, and ideas. The information needed to become fit, wealthy, healthy, famous, confident, and likeable is readily available. The challenge isn't information. It's implementation. It's frustrating to feel that everything you need to know is available, yet you still can't make the changes you seek. You're not alone in that frustration. Sure, your mother told you that you can be anything you want to be, but she lied to you. If you're 5' 5", awkward, and 50 years old, you're never going to play in the NBA. You're also probably not going to be the prime minister of Japan, an astronaut, or co-star in a blockbuster with Brad Pitt. * You can do amazing things, but if you set your sights too high, you'll become frustrated and lose your motivation to continue. * Set self-improvement goals that you believe you can attain. You can always set bigger goals after you've experienced some success. * For example, you might want to earn $10,000 per week, but starting with a goal of earning $2,000 per week could be exciting without the stress of the larger goal. Losing 50 pounds is a reasonable goal but accomplishing it in a month is not. * You can do a lot if given enough time. Changing your life is entirely possible. Doing so at a breakneck pace is less possible. It takes time to gain momentum, and it's important to have positive feelings about all of your progress. It's the only thing that will keep that progress coming. * If you have 50 pounds to lose, it's not easy to get excited about losing 3 pounds. It's not easy to feel motivated after saving $1,000 when your goal is to save $1 million. But you still have a reason to feel good about yourself! Encourage yourself to keep up the momentum with a reward. * Reward yourself for even the smallest improvement. Rewarded behavior is more likely to occur in the future. Reward yourself for a day of healthy eating or saving an extra $10. Be generous with your rewards! 4. Create daily habits that move you forward. It's typically not single, monumental actions that change your life. It's the little things you do each day, day after day after day. * Create new habits that guarantee you'll reach your goals. Then you only have to worry about your compliance. There are currently things in the way of your self-improvement objectives. It might be your attitude, a close friend, your lack of skills, or your lack of time. * Making an effort to reduce or remove these obstacles can make a big difference in your success. Setting reasonable timelines and sticking to them requires patience. When you're motivated, it's hard to be patient. However, if you lack patience, you'll never last long enough to experience significant gains. You can work on several self-improvement objectives at once, but introduce only one at a time into your current routines. * Making too many changes at once is overwhelming and a fast track to nowhere. * Give yourself a little room to breathe and get one self-improvement project well underway before starting a new one. There's never been a better time to work on improving yourself or your life! So much information in so many formats is now available on how to change your life. The only tricky part is applying the information consistently and reaping the rewards. Learn more here in my online self help super-site about how to create and use a self development plan to become happier and more confident in your life. One of the best ways to make positive changes to your life is to take more risks. Life is more exciting and rewarding when you're willing to put yourself out there and take a few chances. Plus, successful people take more risks than unsuccessful people. 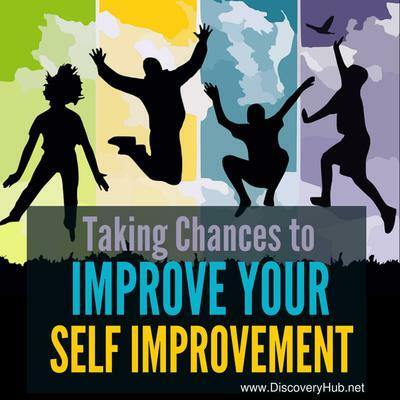 With a little practice, you'll find that taking a chance or two adds immeasurably to your life. 1. Taking chances enables you to move beyond your comfort zone. Nothing ever changes if you don't do something new. It's not easy to force yourself to do something that makes you feel uncomfortable, but it's necessary if you want to experience growth in your life. Imagine the new adventures you can have! 2. Taking chances gives you power over yourself. Most people are risk-averse. It's not in our genetic makeup to take chances. We're like an antelope hiding in the tall grass, afraid to run out in the open for fear of being eaten by a lion. But there is tremendous power in taking chances. * When you can make yourself do things you don't want to do, you realize that you're conquering yourself. * This power extends to other areas of your life. You'll find that you'll do a better job of taking care of the mundane, but necessary, tasks in life. Taking action in the face of discomfort has a powerful impact on your life. 3. Taking chances gives you greater power over your life. You can take control of your life by taking steps to build the life that you desire. This gives you greater control. You can determine how you want to move forward, how you can overcome obstacles, and then do it. * Think of the people that never take chances. They're much more susceptible to the randomness of life. External conditions have a greater effect. By taking a chance, you can avoid all this. 4. Taking chances reduces feelings of regret. More people regret the things they didn't do than the things they did. Not taking chances in life leads to regret in your later years. 5. Your life is more exciting when you take chances. One of the most frequent complaints of adults is boredom. Do you live the same day over and over? The time flies by because there's nothing to differentiate one day from the next. There are no victories or defeats, just the dullness that comes from monotony. * Add some spice to your life and have a reason to get up in the morning. Take a chance or two. 6. You'll develop greater self-confidence and self-esteem. When you have control over yourself and your life, you feel pretty good about yourself. These qualities influence all the other parts of your life, too. 7. You have more opportunities. Taking chances exposes you to even greater opportunities. When you're willing to act boldly, life seems to meet you halfway. It can be a great boost to the amount of success you experience in life. Taking chances can be scary, but ask yourself what you have to lose. Whether it's approaching someone attractive or sending your resume to your dream company, what do you have to lose? Most risks have little potential for real loss. The threat is inside your head. For your best results, start slowly. Decide to take one small risk each day for a month and measure the effect it has on your life. Then you can move up to taking bigger chances as your tolerance for discomfort improves. Discover the power of taking a chance. Start today! You'll be glad you did!